Starting with the 2012 tax year, all income-earning Portland adults living above the poverty level will pay $35 as a result of the measure. 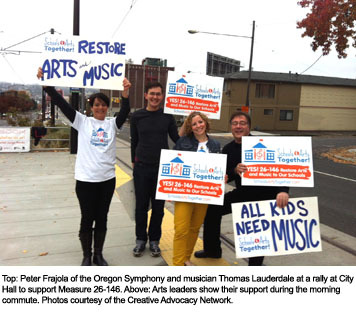 Over half of the proceeds (an estimated $6.8 million) will go to the six school districts that operate in the city, to hire art and music teachers for K-5 students, restoring arts learning programs that have fallen under the ax of state and local budget cuts. 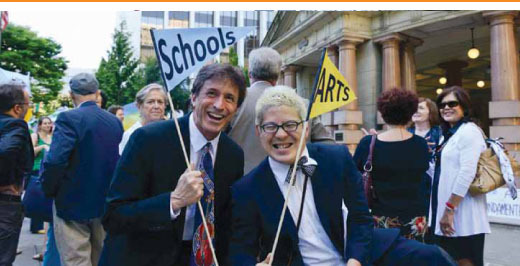 RACC will also play a new role in coordinating arts education in public schools. The rest of the funds (about $5 million) will be distributed by RACC to nonprofit organizations and schools, helping them increase access not only for students but for all Portlanders, with a particular focus on communities that have been underserved in the past. 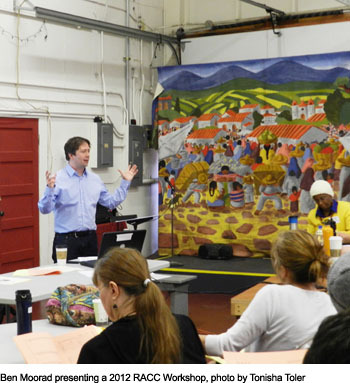 IN 2012, RACC brought artists and others together to share tools that can widen audiences, hone business strategies, and open up new funding sources. Artist and performer Gigi Rosenberg hosted workshops in Portland and Oregon City on effective communication, leaving participants with easy-to-implement ideas on how simple conversations can help take their work to the next level. Write Around Portland cofounder Ben Moorad led a hands-on grantwriting seminar that showed how the quest for funding can also be part of the artistic process. One session from Sound Advice attorney Peter Vaughan Shaver gave a rundown on copyrights and contracts in the music industry, and another featured a lawyer, booker, and musician on a panel to discuss moving a music career forward. In another sold-out workshop, marketing consultant Elgé Premeau shared strategies for getting the most out of online tools Twitter, Facebook, and more. Many of the popular workshops, which cost between $25 and $35, will repeat in 2013, and some sessions are already selling out. MANY ARTISTS have no plans to paint an outdoor mural or see a permanent sculpture through the fabrication process. But they can still join the public art collection—and the conversation— as part of the Portable Works Collection. In March, RACC announced the purchase of 52 works by 32 artists, bringing the collection to more than 1,000 pieces. The artworks are displayed on a rotating basis in publicly accessible buildings throughout Portland and Multnomah County. Additions to the collection are made only when a significant amount of money has accumulated from city and county contributions. 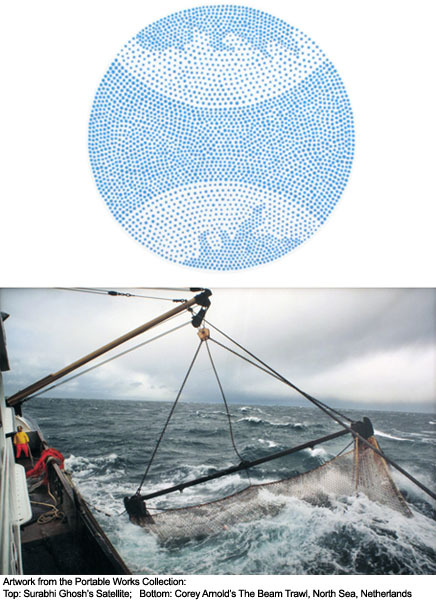 The recent round of purchases totaled $57,100 and covered subjects as local as Hampton Rodriguez’s paintings of Alberta Street, and as distant as Corey Arnold’s photographs of fishing boats on the North Sea, or Surabhi Ghosh’s planetary Satellite paintings. Rodriguez, Arnold, Ghosh, and the other artists included in this round of acquisitions all had one thing in common, though: All of them are new to the Portable Works. In an effort to expand both the diversity of artists and the subject matter in the collection, only artists not yet represented were eligible to submit work.